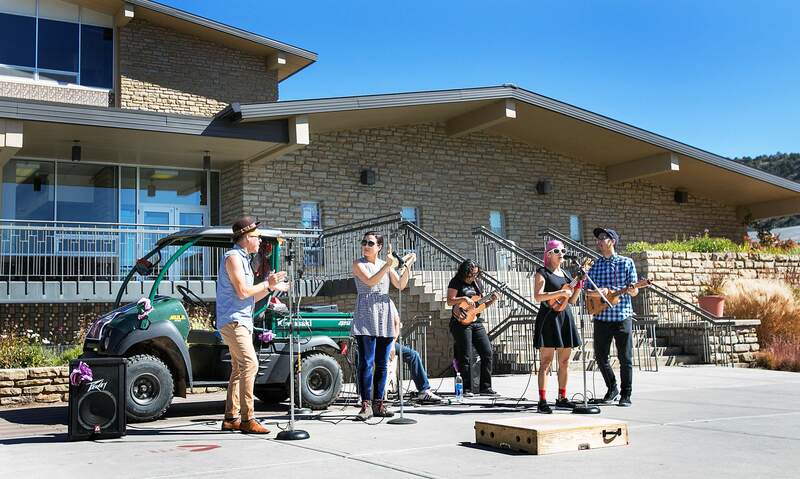 From left, Hector Flores, Leah Gallegos, Gloria Estrada, Denisa Carlos and Daniel French of the band Las Cafeteras perform in front of Reed Library on the campus of Fort Lewis College in October as part of the Real History of the Americas series of workshops and performances on campus. Student Ruthie Edd hopes Durango’s formal recognition of Indigenous Peoples’ Day will encourage more people to attend the activities this fall. This year, Durango will recognize Indigenous Peoples’ Day on the second Monday of October, after a decision this week by Durango City Council. Fort Lewis College student Ruthie Edd, who advocated for the recognition of the holiday to replace Columbus Day, hopes it will give students, teachers and the community in general an opportunity to talk about Native American history and the history of indigenous people around the world. “It’s really to celebrate and to heal and also to connect on both sides,” she said. Growing up in Durango, she found Thanksgiving and Columbus Day were some of the times in school when people would talk about Native Americans. She hopes the new holiday will be a platform for cultural awareness. “It can be really hard, especially for younger students, to be a voice for their culture,” she said. She became more of an advocate in high school and has stayed involved with the Peace Leader of the Diné Club on campus. Edd founded the club for Navajo students to practice their culture and language together. She also authored the resolution adopted by the City Council on Tuesday. “I think by high school, I had understood if we didn’t speak out, no one would hear us,” she said. Edd and her friends advocated for Fort Lewis College to recognize Indigenous Peoples’ Day this year. The designation was approved by the Associated Students of Fort Lewis College and President Dene Thomas’ cabinet in December. Many other cities, including Seattle, Albuquerque and Minneapolis, and several states have also recognized the holiday, which helped inspire Edd. In honor of Indigenous Peoples’ Day, she wants community members, especially students, to come to the Real History of the Americas activities held at Fort Lewis College. For the last eight years, students have organized a celebration of the history of North and South America from the perspective of Native, Hispanic, African-American and Asian peoples, among others. “It can be really hard to articulate everything in an academic setting or in writing,” she said. Out with Columbus, in with Indigenous Peoples Day?